They have absolutely no idea about the power they have! The Committee recognizes that inflation persistently below its 2 percent objective could pose risks to economic performance, but it anticipates that inflation will move back toward its objective over the medium term. (July 13). The last is a bit better, but not very convincing. They could have skipped the “could” and not just “anticipate”, but that they would take the measures necessary to reach the target. So how has inflation, both headline and core measures of their preferred inflation indicator, been behaving? Just as 19 months ago they ‘anticipated’! 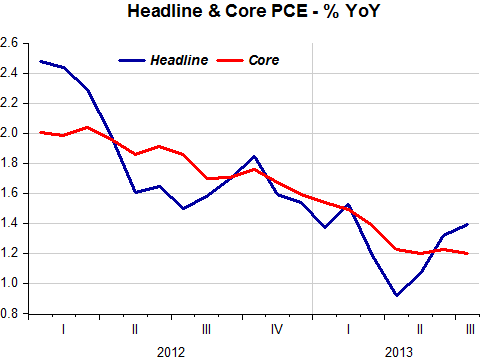 Even worse, the PCE inflation measures are not only below target but trending further south! We spend a lot of time thinking about how to get out of a liquidity trap. Maybe we can think more clearly about that question if we instead ask the exact opposite question. How can you get an economy into a liquidity trap in such a way that someone else couldn’t get it back out of that same liquidity trap just by reversing whatever it is you were doing? Because it’s not really a “trap” if someone else can get the economy out of it. I can only think of one plausible candidate that might work: inflation inertia. If there is inflation inertia, monetary policy still ultimately controls inflation, but the inflation rate has a lot of momentum, so that it’s hard to get it to speed up or slow down quickly. If there is sufficient inflation inertia, I might be able to get the Canadian economy stuck in a liquidity trap so badly it would be very hard for anyone else to get it out again. Empirically the evidence seems to be mixed, at least to my eyes. During relatively normal times there looks like a lot of inflation inertia. 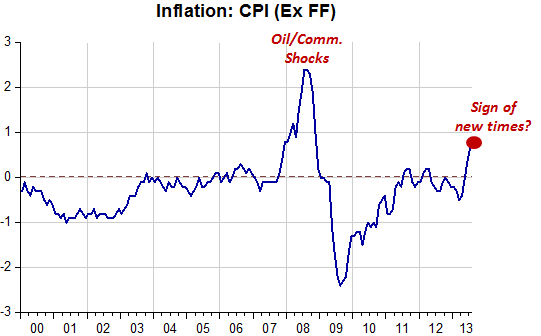 It’s just too easy to forecast inflation, especially core inflation, from lagged inflation. But in abnormal times, when there is a clear change in monetary regime that changes expectations, inflation seems to change very quickly. We saw that when the Bank of Canada announced the original inflation targeting agreement. We saw it even more clearly in Sargent’s “The ends of four big inflations” (pdf). Dragging me out of the Bank of Canada and putting Steve Poloz back in charge would be a very big and obvious change in monetary regime. Dunno. It might be possible to get an economy irreversibly stuck in a liquidity trap. But it’s a lot harder than you might think. 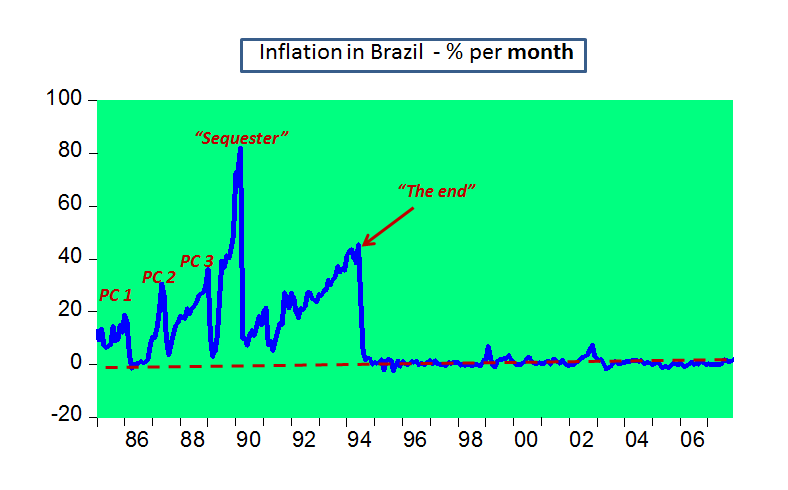 All that reminded me of the grand excuse in Brazil during the 20 years of ‘galloping’ inflation. It was said that monetary policy couldn´t do much because, you guessed, inflation was inertial! So policymakers tried alternatives: Price guidance, Price controls, Price freezes and culminating in the ‘sequester’ of people´s financial assets! And inflation kept climbing higher and higher…until one day (literally) it stopped à la Sargent. The equivalent alternatives to supposedly inertial low inflation are QE, forward guidance and the like. But like a sequence of price controls they don´t seem to change expectations. Just as you cannot get irreversibly stuck in an hyperinflation, you cannot get irreversibly stuck in a liquidity trap. It´s always someone´s (usually the leading policymaker´s) choice. Yes,” if there´s a change in monetary regime that changes expectations, inflation seems to change very quickly”. In addition to the examples of Canada, Sargent´s and Brazil, there is the dramatic price reversal in 1933 when the US delinked from gold and monetary policy became credibly expansionary (irrespective of interest rates). My conclusion is different from Nick´s. It´s just as easy to get the economy stuck (not irreversibly) in high (hyper) inflation mode as it is to get it stuck in a liquidity trap. And it has nothing to do with the level of interest rates (ZLB or IUB (infinite upper bound)). It´s the policymaker´s CHOICE. And in this day and age it´s ‘politically correct’ to keep inflation ‘inertialized’ at 2%, come hell or high water! First there was a “trick” applied for a few months to ‘align’ relative prices (see here) and the exchange rate anchor introduced on June 30 1994, for some reason, was immediately credible. Credibility over an inflation target also garnered ‘instant’ credibility in March 99 when the exchange rate anchor was ‘pulled out’. Consumer prices excluding fresh food climbed 0.7 percent from a year earlier, the statistics bureau said today in Tokyo. That exceeded the median estimate of 29 analysts surveyed by Bloomberg for a 0.6 percent gain. Industrial output rose a less-than-forecast 3.2 percent from the previous month. The BOJ’s loosening is “in its early stages, and I hope you will be patient enough to see its effects permeate the economy,” he said. 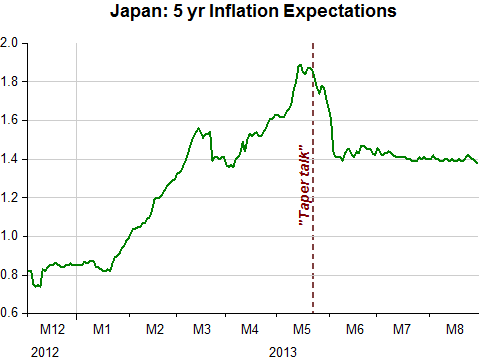 Just hope they become a bit impatient because inflation expectations have been ‘dormant’! Nunes and Cole deserve credit for making monetary policy and history accessible to a larger audience. Popularizing NGDP targeting as a policy rule by presenting it intelligibly and using it as a framework to re-examine accepted macroeconomic orthodoxy is a valuable endeavor. Especially welcome are their arguments against the “Great Recession as market failure” paradigm which is, unfortunately, one of the most prominent explanations (if not the most prominent) among the public and non-economist intellectuals. However, a stronger link between their claims and the logic of individual action could have made their arguments more persuasive, and further distanced their position from the “macro-as-engineering” approach they disdain. Readers of this journal who read Nunes and Cole will come away with a further appreciation of Market Monetarism, but will recognize the political economy issues associated with institutionalizing a sound monetary environment are far more complicated than the authors suggest. It´s almost as if the Fed doesn´t want others to succeed! Bank of England Gov. Mark Carney, in his debut speech on Wednesday, announced new measures to boost lending in the U.K. and said the central bank is ready to step in with fresh stimulus if the country’s economic recovery falters. Once again, however, his message seems to have fallen on deaf ears: U.K. government bonds fell and traders stuck to bets that the Bank of England won’t be able to keep its pledge to hold interest rates at a historic low until 2016. Just hope they learn quickly! 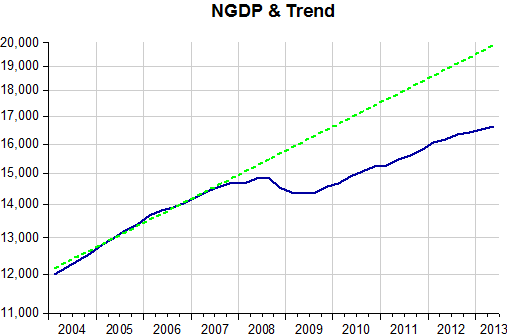 For now, they´re just trying to mimic Bernanke who is fond of saying “we can do more if needed”! 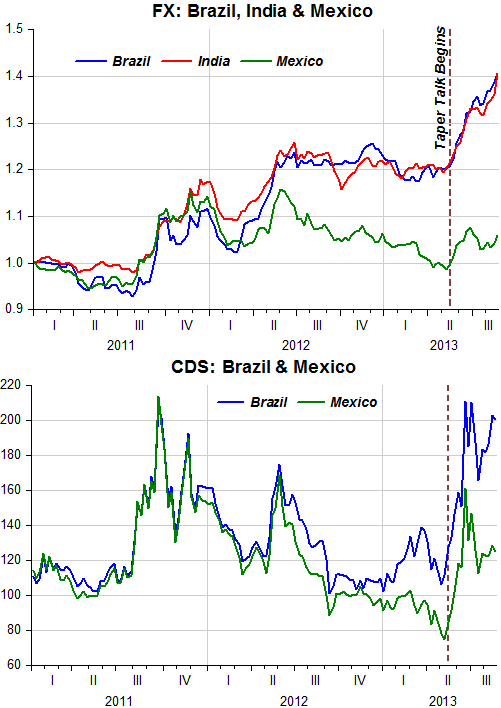 India and Brazil, among some other countries, are seeing their exchange rates balloon. But why, for example, isn´t Mexico in the same straits? The “taper talk” that began in May had a “tornado effect” in some places, specifically in those countries who´s defenses were “weak”, while having only a very minor effect on countries, like Mexico, who were better “dressed up”. One difference that seems to matter is that while Mexico (despite registering the lowest gowth among the three countries) late last year ushered in a reform-minded government, the other two are on the run-up to elections next year. To politicians that means “don´t rock the boat” and if at all possible let´s hand out more “goodies and freebies”! Steve Sailer pointed out that the view that Economists and Social Scientists are worthless is biased by the non-overlap between questions people are currently interested in and questions social sciences can answer. Example: He defended Milton Friedman by pointing out that Friedman was the loudest critic of Nixon’s somewhat widely supported Price Controls. Friedman was right and people forget that the efficacy of Price Controls was once a contentious issue and therefore underappreciate Friedman in particular, economics in general. The issue of Price Controls was RETIRED from general discourse. Your response to Andolfatto’s request for a ‘theoretical model’- “it’s the NGDP stupid”- reminded me of Sailer’s point. If you guys are right about Macro, you guys basically RETIRE the entire field of Macro! Imagine how useless Econ will seem 40 years from now with NGDPLT adopted, effective, it’s wisdom “obvious” to all and it’s once-contentiousness forgotten! Krugman congratulates Economix (The NYT Blog) for being the second most influential in the world (although I believe only English language economics blogs are considered). That´s a cute way of drawing attention to #1. 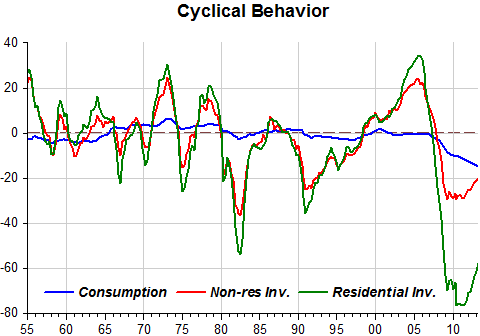 Looking at the period after 2007, we may see where this unfamiliar consumption-investment dynamic is coming from. Real output has dropped relative to trend by an order of magnitude greater than at any other time and, apparently, refuses to regain its former ‘status’. Wouldn´t that be the natural outcome of a driving process – nominal spending (NGDP) – that remains depressed? The “theoretical model” that generates this type of consumption investment dynamic goes by the name of “very bad monetary policy” i.e., one that forgets that good results come from securing nominal stability! “It’s fairly obvious that monetary policy does not have instruments to restore ZLB economies to their normal conditions, else much more progress back to normal would have occurred”. Yet that raises a critical question: how can we know this? How can we know that even more intervention would not have generated more progress back to normal? Similarly, how can we know that the path of the recovery doesn’t more or less reflect the Fed’s preferences? While we should certainly explore many different stories about the recovery, there is a parsimonious explanation for the economy’s behaviour sitting right in front of us: that inflation has been relatively stable because the Fed has targeted stable inflation, and the Fed’s choice not to raise inflation higher—and thereby reduce the real interest rate further—accounts for continued high unemployment. That should be the null hypothesis, and I’m not sure on what grounds Mr Hall rejects it. We should assume that a central bank with the ability to print money and buy extraordinary quantities of assets and foreign exchange can raise inflation if it wants to. Instead of the word inflation I would use NGDP, because it´s spending that drives the process, with (some) inflation being a possible outcome. 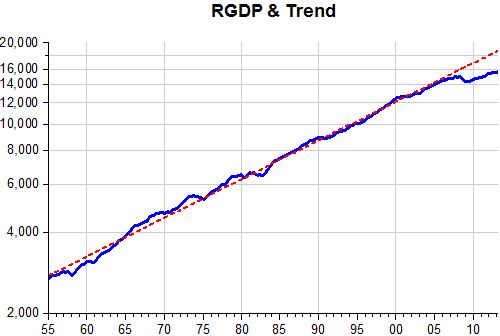 In the 1982-83 recovery phase, for example, inflation came down throughout. Today it would be a good sign if it went up a bit with the rise in spending. 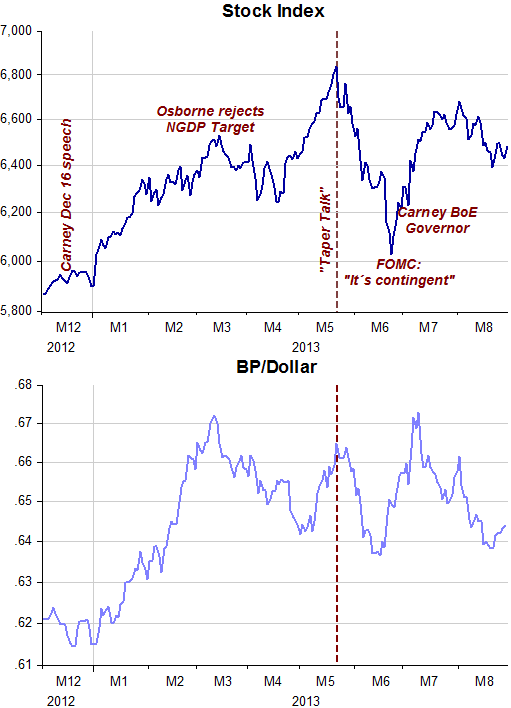 And it´s well known that Ben – “making sure “it” doesn´t happen here” – Bernanke is a 1%-2% inflation guy! And that´s how the system works when everyone´s expectations of inflation is so well aligned, or “anchored”. 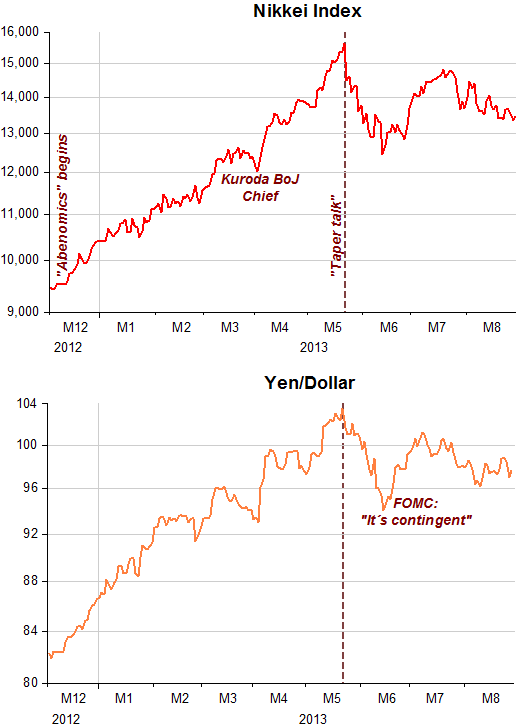 So yes, the path of the recovery (for want of a better description) reflects the Fed´s preference pretty closely. 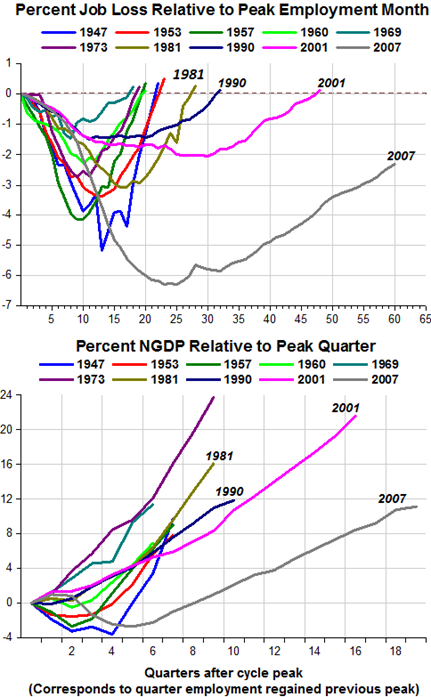 The chart below illustrates the recovery paths of post war cycles. The longer the time the economy spends in ‘coma’ the more important are the hysteresis effects…some permanent ‘brain damage’ is to be expected. But if 1%-2% inflation is maintained that´s all that matters!